Some of my current items for sale can be seen below. Please view my catalogues to see a wider range of my specialities and please contact me with any enquires and requests. COURTANVAUX, Francois Cesar le Tellier, marquis de (1718-1781); [LE ROY, Pierre] Journal du voyage de M. le marquis de Courtanvaux, sur la fregate l'Aurore, pour essayer par ordre de l'Academie, plusieurs instrumens relatifs a la longitude. Mis en ordre par M. Pingre, nomme par l'Academie pour cooperer a la veerification desdits instrumens, de concert avec M. Messier. A Paris: A Paris : De l'Imprimerie royale., MDCCLXVIII  FIRST EDITION. Quarto. Recent full calf binding, central lozenge design, spine in blind tooled panels with gilt lines and contrasting morocco title label, some very light browning and occasional light spotting. Pagination pp. , viii, 316, , collated and complete with 5 engraved plates (4 folded) and the folded engraved map. [National Maritime Museum Catalogue v.I. 1149a; Norman 1335]. Courtanvaux had been destined for a military career until ill-health forced him to resign in 1745. He subsequently took up the the study of the natural sciences, and was elected to the Academie des Sciences in 1764. The present work is his report of a voyage in the frigate l'Aurore - a vessel that Courtanvaux fitted out at his own expense to allow for the accurate assessment under everyday conditions of the various competitors for the prize offered by the Academie (for the first successful method of accurately measuring longitude). The main contender assessed was the Horloger du roi from 1754, Pierre Le Roy (1717–1785). He had invented a completely original marine chronometer in the 1750s, which he perfected over the next decade and presented to Louis XV in 1766. In 1767 Le Roy entered his machine, which "embodied all the principles upon which later marine chronometers were constructed" (Norman), in the competition. The present voyage between Le Havre and Amsterdam was the first practical trial to which it was subjected. Le Roy was awarded a double prize in 1768, for his chronometer and for his memoir describing it. The first four chapters give a detailed account of the different methods employed from the 15th to 18th centuries to determine longitude. The rest of the work, written by Courtanvaux, Pingre and Messier, describes the voyages and the experiments carried out. The final chapter is devoted to a recapitulation of Le Roy's marine clocks. WILBERFORCE, William (1759-1833); POLE, Thomas (1753-1829), A group of three interesting autograph letters from abolitionist William Wilberforce, each addressed to the Quaker physician and educationalist Thomas Pole. Letters dated Dec. 22 1814; Oct. 17 1815; Oct. 17 1815. The two earlier letters are in the hand of William Wilberforce, the third in that of his secretary; all three are signed by Wilberforce, and each has the original mailing envelope inscribed with his name and that of Dr Pole. The letters mainly concern Pole’s influential book on adult education, ‘A history of the origin and progress of adult schools: with an account of some of the beneficial effects already produced on the moral character of the labouring poor’ (1814), which was arguably the first study on adult education and helped launch a national adult school movement in the United Kingdom. OLDROYD, JOSHUA, WINE-MERCHANT] A Catalogue of all the Genuine Household Furniture, Plate, Linnen, and China, of Mr. Joshua Oldroyd, Wine-Merchant, deceas'd, at his late Dwelling House on Tower-Hill, the corner of Tower-Street: Consisting of Damask, and other Furniture, Bedding, Chairs, Tables in Mahogany, and walnut-tree, Sconces and Chimney Glasses, Stove Grates, an Eight-Day Clock by Webster, two Lead Cisterns, a large Copper, Brewing Utensils, and Kitchen Furniture. To be sold by Auction, on Thursday the 9th Instant, Aug. By order of the Executor. The whole to be viewed on Wednesday the 8th Instant, and till the Time of Sale, which will begin at Eleven, all being sold in one Day. Catalogues to be had at the Place of sale the Day of viewing, and at Mess. Whiting and Macquistin, Upholsterers, in Watling-Street. Not one article in this Sale, but what was the property of the Deceased. Thursday, August 9, 1753. Octavo. Original plain grey stitched wrappers, manuscript inscription to front cover "Mr. Hussey's Catalogue", very good original condition. The catalogue details conditions of sale, quite straightforward, noting increments and outlining conditions for payment and collection. Numb. VIII. In the Yard and Brewhouse. 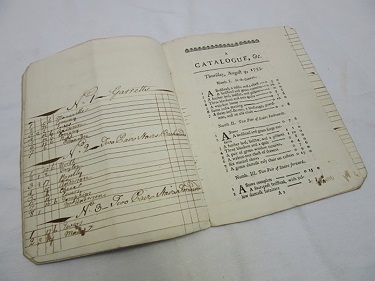 The catalogue is interleaved throughout with items manuscript ruled sections, carefully noting prices paid and by whom; the results generally exceeding estimates and the names frequently repeated. A remarkably nice and evocative survival. The catalogue is unrecorded on ESTC.